HONDIUS, J. - Frisia occidentalis. Frisia occidentalis. - HONDIUS, J. Size : 15.2 x 19.5 inches. / 38.5 x 49.5 cm. 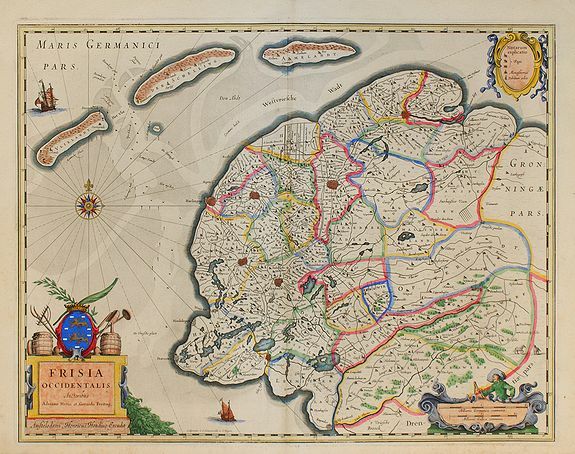 Description :This fine map of Friesland was made by the Franeker scientist Adrian Metius. The main towns are shown by miniature plan, attractive title cartouche bottom left, key cartouche top right, scale cartouche bottom right. Compass card and rhumb lines in sea area. Signed by E.S. Hamersveldt and S. Rogier bottom centre.